As time is limited, do you wish to know what are the important areas to cover before UPSC Civil Services Preliminary Exam? 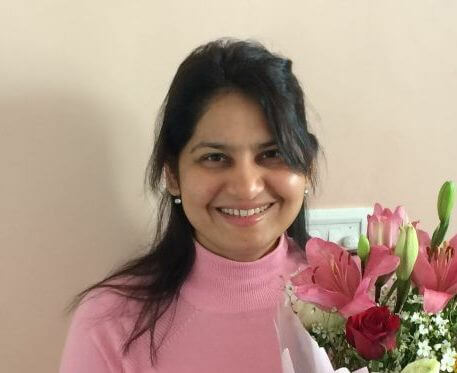 What are the most probable questions for IAS Prelims? 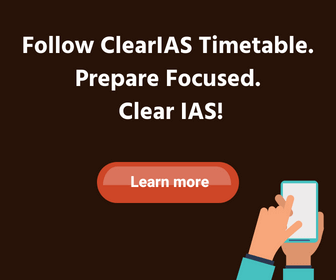 One fast way to find the priority areas is to join ClearIAS Prelims Test Series, where we cover almost all important areas. Did you miss email updates of ClearIAS? Don’t worry! Being an affordable program for millions in the country, we usually discuss most-probable questions, strategies, tips, study materials, exam information and promotional offers via email for all those who have subscribed to our email program. 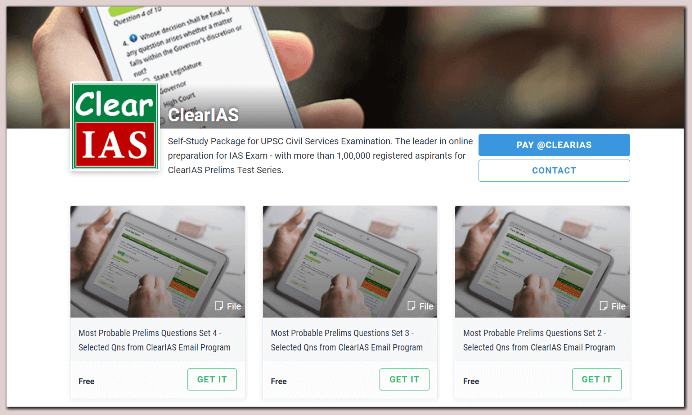 ClearIAS Email Subscribers used to get daily mock questions for UPSC CSE Prelims. But if you missed some of our email updates, don’t worry. As exams are near, we have compiled the same and made it into 6 PDF sets. All the 6 PDF sets are available for free download from ClearIAS online store at Instamojo. In future, make sure you are active on our email list by regularly checking our emails. We will be removing inactive subscribers from our email list, as part of our routine maintenance – to cut cost and to remain focused only to serious aspirants. 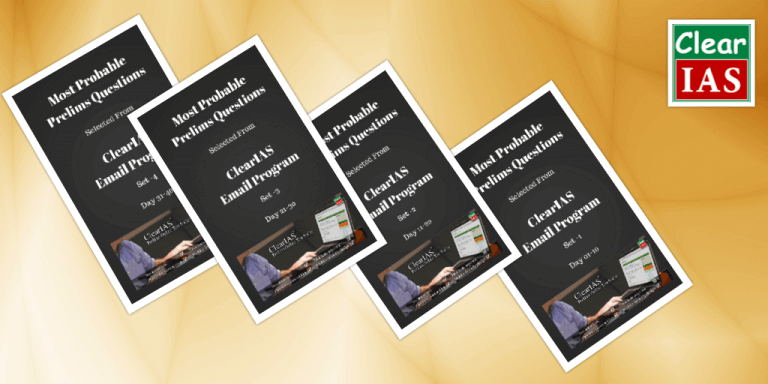 Now, compilations of ClearIAS study materials and mock questions are available for download from the ClearIAS online store. Learning made easy and faster! As you know, ClearIAS always wish our students to get the best. Quality service at an affordable cost is our motto. We will be soon releasing more PDFs which will make learning easier, smarter and faster. Check ClearIAS online store at Instamojo to download our products. It’s completely free. Download and share with your friends. “Current Issues – What’s Hot Today” is a unique analysis by www.clearias.com on various contemporary issues. The details presented in this ebook will be highly useful to answer various questions from the current affairs section of UPSC Civil Service Exam – Prelims, Mains and Interview. Details – 130 Pages; Version 1.0. It will work. Open the link in a new window. Also, you will get a copy of the download link in your email. Hi Nitul, check if your entered email id is correct. The link to download the files will be sent to your email id. hi sir. tanks for your excellent pdf set. but I can not download the all PDFs. so could you sent it through e-mail? Is this above given pdfs for 2019 or 2018? Sir I am beginner and I want to join your mock test series but plz tell me sir ,”may I join your test series in Hindi medium “???? ClearIAS mock tests are available only in English. But, many Hindi medium aspirants like you have already registered for Prelims Test Series, and are taking our mock tests comfortably. We suggest you to try our free mock tests first, and if that’s fine for you, you may enroll for our full-length test series. Link here. the download link set to my email downloaded an error pdf can’t open it.